2 in 1 Jerky Slicer & Tenderizer Attachment: The LEM 2 in 1 Jerky Slicer/Tenderizer Attachment slices meat up to 1 1/4" thick. 14 perfect jerky strips sliced and ready for the oven or dehydrator in seconds. Strips of jerky will be 1/4" wide x 14 strips. 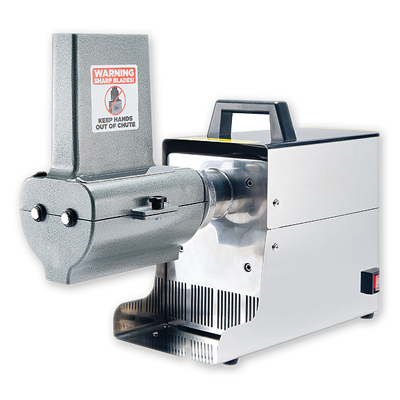 Remove the easy off top; replace the slicer shaft with the tenderizer shaft and tenderize even the toughest cuts of meat using the power of your grinder. Easily disassembles for clean up. Body is made of durable powder painted aluminum. No tools or assembly required. Chute Dimensions 1 1/4" x 4 1/2" x 8". NOTE**This unit will only attach to LEM Big Bite Stainless Steel Grinders, model #'s 777, 779, 780, 781, & 782; will also attach to LEM older grinders #'s 535, 536, 538, 538A & 540.